To paleontologists, this coral truly does not become a “Petoskey stone” until someone slices and polishes it (and charges lots of money for it). In its natural form, it is really a piece of Hexagonaria coral. Scattered along the northern Lower Peninsula shorelines of Lakes Huron and Michigan, this fossil holds natural attraction for people. One can sometimes see this coral, rounded by relentless waves, worn smooth and showing its beautiful internal structure. It is easy to see that rock hounds, jewelry makers and almost everyone would be taken by this striking fossil. Once removed from the water, however, it quickly dries and loses its bright polished shine. In order to achieve that permanent shine, it is necessary to polish the rock by sanding and grinding it with various grits of sandpaper and abrasives, finally finishing it with a polishing compound in order to bring out the beautiful luster of the stone. Then it is a Petoskey stone. The Hexagonaria coral is a colonial marine animal that lived in warm shallow salt water tropical seas. Prehistoric Michigan was once such an environment. During the Devonian Period, some 415 million to 355 million years ago, Michigan was much closer to the equator. Much of Michigan’s bedrock is made up of huge limestone beds that underlie the surface soil. These large tracts of limestone bedrock are the remains of ancient coral reefs that filled the sea that once covered what is now Michigan. These coral seas were full of a variety of creatures that included corals, both solitary and colonial. 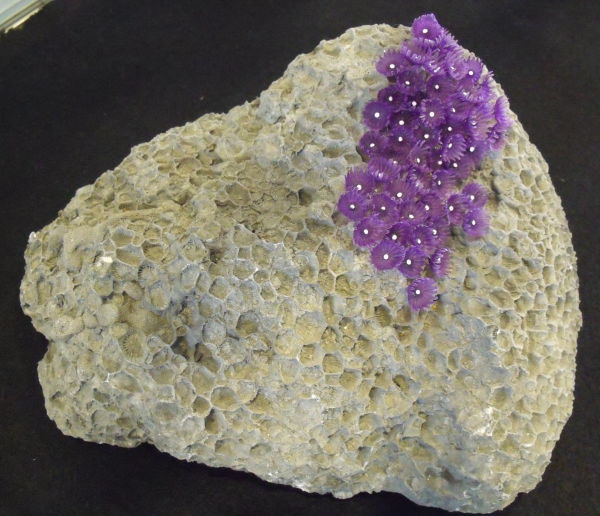 HEXAGONARIA coral head with several simulated coral polyps as an example of how this creature may have looked in life. Corals live in a symbiotic relationship with a variety of marine algae. Although these corals had tentacles similar to those of sea anemones and were able to capture food such as plankton and even small fish, the algae provided much of what the corals needed for survival. Food such as plankton was captured by tentacles and brought down to the center where the mouth and stomach was located. The algae used a process called photosynthesis to provide additional energy to the coral polyp. In turn, the hard exoskeleton of the coral and stinging tentacles provided protection for the algae. The coral polyp produced waste products that the algae needed for its survival. Because sunlight is needed for the algae photosynthesis and sunlight only penetrates the ocean to a certain depth, the corals only grow in shallow waters of 30 to 150 feet. Corals are marine organisms that are made up of many — sometimes thousands — of hard calcium carbonate exoskeletons called corallites. Each corallite contains a polyp, or an individual multi-cellular animal. There are two major types of corals found in Michigan: solitary corals growing by themselves, and colonial corals growing in a tight community of genetically identical polyps. The polyp is the actual living individual creature that inhabits each corallite. As the coral grows it extends the calcium carbonate exoskeleton and seals off part of the base. Corals can reproduce asexually and sexually. Certain corals also reproduce sexually, releasing both sperm and egg into the marine environment. The mixing of the two results in the production of larvae, which then float in the ocean currents. Within two days to three weeks, the larvae attach themselves to rocks or other corals on the reef to begin their lives as reef builders. Each corallite of the Hexagonaria is made up of a usually six-sided “compartment” that adjoins the others in the colony and creates an elaborate hexagon. The radiating lines one sees in the Petoskey stone are the septa and theca. The septa are the lines of division between each corallite, and the theca are the internal radiating lines. Theses patterns of hexagon shapes and radiating lines are what eventually give the Petoskey stone its uniqueness among rocks. Rounded HEXAGONARIA coral as found on the beach near Charlevoix. In many cases it is hard to discern what they are until they are moistened with water to reveal the delicate structure. 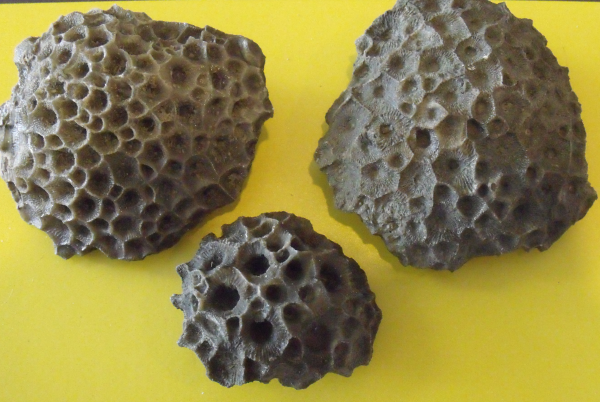 The Hexagonaria are found across the state of Michigan along lakeshores and rivers in sediments commonly called the Traverse group. They are rounded fragments of the coral Hexagonaria. Some of these coral reefs still lie beneath the ground and under the water of Little Traverse Bay. Due to the waves and abrasive action of the sand, these stones are rounded and washed up on the beach. The action of ice also brings these stones into shallow water. 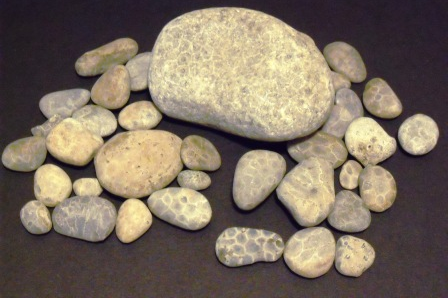 The best time to hunt for Petoskey stones is in the spring as soon as the ice melts. I have even seen locals donning wet suits and walking in waste deep water as ice floats by, picking up the stones before they even reach shore. The name Petoskey came from an old Odawa Indian legend. It is said that a French fur trader named Antoine Carre came to Michigan and traveled extensively in the area now known as Petoskey, where he met and married an Odawa princess. In time he was adopted by the local Odawa tribe and eventually was made their chief. It is further told that in the spring of 1787, while traveling with his wife on his way from near present-day Chicago, he camped near what is now Kalamazoo. During the night, his wife gave birth to a son. It is legend that as the morning sun rose, the rays of the sun fell upon the infant’s face, and his father pronounced his name to be Petosegay and predicted that he would be an important person. The translation of the Odawa “Petosegay” means sunbeam, or rising sun or rays of dawn. Petosegay became a fur trader like his father and also became quite wealthy. He owned much land in the Petoskey area, and a community was settled on the shores of Little Traverse Bay. The present location of the city of Petoskey stands as a tribute to Petosegay. 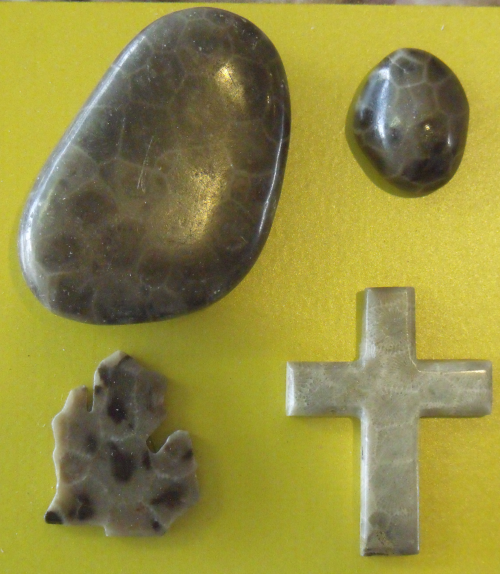 Because these rounded and water tumbled fossils were found in great abundance on the shores of Little Traverse Bay, they became known as Petoskey stones. The Petoskey stone was made the state stone of Michigan by legislative action. House Bill 2297 was signed by then-Gov. George Romney in 1965, thus elevating this fossil to the prestigious position it now holds around the world as something one must seek, find or purchase when visiting Michigan. Joseph J. "PaleoJoe" Kchodl is an avocational paleontologist originally from Lewiston, N.Y. 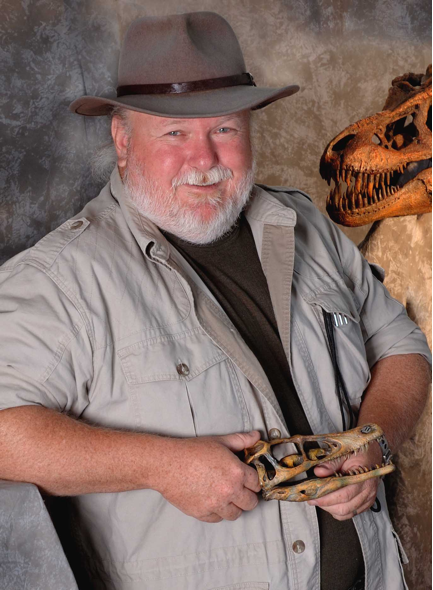 Since moving to Midland in 1993 he has continued his lifelong passion for the collection and preservation of fossils as well as educating the public about our prehistoric past. He has developed a nationally traveling museum exhibit on the ancient sea creatures called trilobites. Since creating that exhibit he has consulted and acted as Chief Science Officer for a new Ice Age exhibit due to begin touring in 2011. He continues to lecture, provide school and library programs across the United States. In 2001 he was awarded the Katherine Palmer Award from the Paleontological Research Institute in New York. In 2008 he discovered a nearly complete skeleton of a Camarasaurus in the deserts of Utah. He has a continuing radio series on WGVU radio and has appeared on TV across the state of Michigan on the WCMU TV series Destination Michigan. His archived radio podcasts may be accessed through his website, www.paleojoe.com.